Israeli Defense Minister Avigdor Lieberman has delivered a speech during a visit to the Golan Heights, speaking about the recent alleged attacks by Iranian forces on IDF positions. Israeli Defense Minister Avigdor Lieberman has called on Syrian President Bashar Assad to remove Iranian forces from his country's territory, arguing that they are not operating in Syria's interests and only further complicate the situation in the country. "Throw the Iranians, Qassem Soleimani and the Quds forces, out of your country! They are not acting in your interest, they are only hurting you. Their whole presence only brings problems and destruction," Lieberman said in the northern city of Katzrin. Early on May 8, the Israeli Air Force reportedly hit dozens of what it called Iranian military targets in Syria after Iranian forces allegedly fired 20 rockets at Israel's frontline positions in the Golan Heights. Speaking about the back-and-forth fire between the IDF and Iranian forces, Lieberman said "there is nothing like the sin of vanity and there is no room for arrogance. […] The tensions have not ended yet and we need to see everything in its right proportions." "This is a permanent policy: if someone is going to carry out an attack against the State of Israel, to launch missiles against the State of Israel, we will always try to strike it first," Lieberman stated. 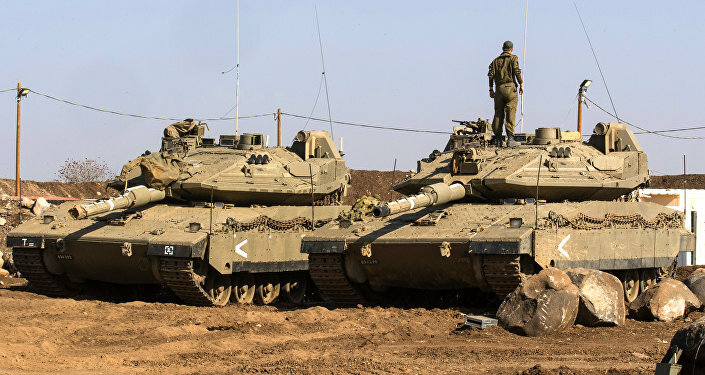 Israeli officials have repeatedly voiced concerns over the growing Iranian presence on Syria's border, as recent tensions in the area have encouraged the Israel Defense Forces to send military vehicles, troops and missile interceptors to the Golan Heights. In April, Israel's Defense Minister Avigdor Lieberman warned Iran of an "appropriate" response to any actions by Tehran that are aimed at "hurting" Israel. Iran replied to the Israeli accusations by asking the Israeli government to stop its "dangerous and constant adventurism and provoking behaviors which are threatening the regional peace and security."